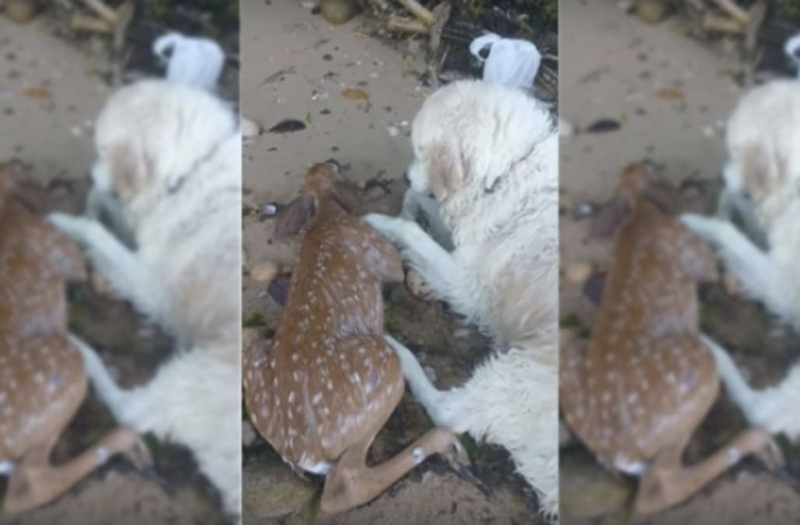 A good dog named Storm was captured on camera rescuing a baby deer. Mark Freeley says he was walking along the beach with dogs Storm and Sarah on Sunday when his pup jumped into the Long Island Sound to investigate an object in the water. Turns out it was a baby deer, struggling to swim. "Storm is trying to save this baby deer," Freeley can be heard saying. "I think he's trying to save him." Freeley then encouraged Storm with a few "good boy" calls. After bringing the deer to shore, it was clear that Storm was indeed trying to save the poor fawn. The deer attempted to run away once on land, but Storm stopped it and began licking and nudging the deer to make sure it was OK. According to Fox 13, Freeley and his pups stayed with the deer until a rep from Strong Island Animal Rescue and a veterinarian arrived. The deer is currently being treated and is expected to make a full recovery from the incident.